You who love the beauty and charm of tourism in Yogyakarta certainly won’t want to miss interesting spots. In addition to extreme activities and natural scenery, in Yogyakarta, there are many regions that offer the charm of the sunrise. The place that is suitable to be used as a vacation destination will also refresh you and your partner, friends, and family. Hence the best Hotels in Yogyakarta with affordable price. Mount Merapi is indeed quite dangerous because this is one of the most active volcanoes in Indonesia. In fact, the hiking trail to the top is often closed because of the danger of Wedhus gembel, so you have to be satisfied just to arrive at Bubrah Market. But, the beauty is truly extraordinary. The mountain peaks have never disappointed in presenting extraordinary panoramas. When you enjoy the sunrise on the summit of Mount Merapi, you will be amazed at the beauty of nature and the power of God. By discovering this area of astonishment, beauty also fascinates the eye. Just to know about interesting facts of Little Seoul in Yogyakarta Indonesia. Parangtritis Beach does offer special twilight scenery apart from the beauty of the beach. 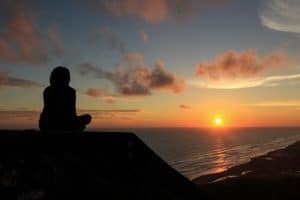 If you want to drop by a little to the top of the hill, namely Bukit Parang Endog, you will be presented with an incredible sunset panorama. 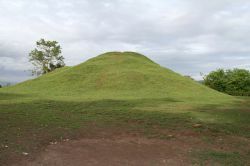 Parang Endog Hill is usually used for paragliding. But, just sitting around capturing dusk is also not prohibited. You will find amazement as long as you are at the top of the hill, you can clearly see the sunrise and the stunning surrounding area. Suitable for you who like the atmosphere of the sunrise at the beginning of a beautiful day. The next best place to see Sunrise in Yogyakarta is Kalibiru. Along the Menoreh Mountains area, you will find a tourist forest in Kalibiru Village, Kokap District, Kulon Progo. Who would have thought, if this place offered a dazzling sunset view? You can go up to a tiny wooden platform built on a pine tree, and you will find a scene that amazes anyone. From a distance, there was a Sermo reservoir surrounded by hills. Wait until the dusk arrives, the hills around the Sermo Reservoir will form a shadow of an amazing sight. So charming beauty when the sunrise comes. Hence the things you may concern when you live in Yogyakarta Indonesia. Prambanan Temple does offer charming sunset and rising views. 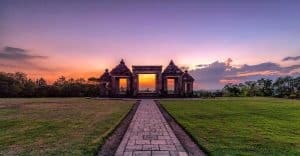 But, you will find the uniqueness of solar sunset in Ratu Boko Temple. In this place, twilight seemed to be framed beautifully by the silhouette of the architecture of the gate of the temple complex which became the icon of the Queen Boko Palace. It’s so beautiful that you will feel comfortable with the calm atmosphere. When the sun rises, the brand new day has just begun, when you look at it you will feel so warm and give thanks to God. Abang Temple’s shape is quite unique. It’s unlike the temple in general. Because it has been covered by a lot of grass, this temple actually looks like a Teletubbies hill. Unlike the general temple, this temple uses red bricks, so it is called the Abang Temple (abang = red). The temple is located in Candiabang Hamlet, Jogotirto Village, Berbah Sub-District, Sleman, this position is quite high. You can freely enjoy the twilight and the morning that appears in the distance, especially being accompanied by loved ones. Sunrise and sunset will look so charming, the cool air and the surrounding scenery make you feel at home for long. The reasons why you must visit Yogyakarta. The best place to see Sunrise in Yogyakarta is in Kulon Progo. Climbing almost 300 stairs at dawn towards Suroloyo Peak is indeed quite exhausting. But, your hard work will pay off with a beautiful scenery of sunrise that emerges from behind the horizon. Mount Merapi and Merbabu appear towering in the distance, forming beautiful dazzling silhouettes. Suroloyo Peak, located in the Menoreh Mountains, Kulon Progo, you can reach by less than one hour from the city of Yogyakarta. You can look at four mountains, namely Merapi, Merbabu, Sumbing, and Sindoro and Borobudur Temple which are sometimes covered in fog from a distance. It’s amazing how beautiful the scenery is. 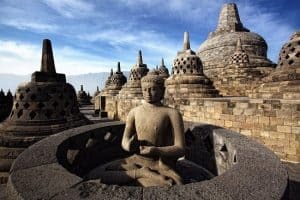 Delaying a little to Magelang, Borobudur Temple presents ancient splendor that is still admired today. Behind its splendor, it turns out that this Buddhist temple presents a unique sunrise view. No wonder many tourists are competing to come here since dawn because they hunt for the sun that woke up and peered timidly. So charming, the attraction of the sunrise will make visitors stunned by the colors and awesome atmosphere. So you will feel at home for a long time. Hence the souvenirs that you must buy in Yogyakarta. Not far from the Borobudur temple complex, there is a hilltop that is worthy of being reached by the dawn hunters. It’s called Punthuk Setumbu. Similar to Suroloyo Peak, here you are also invited to climb steps to reach the viewing post at the top of the hill. From here, the sunrise looks magical with the foreground silhouette of Borobudur Temple which is sometimes covered in fog. The atmosphere in this place is truly amazing, so it will bring you in a cool, peaceful and soothing atmosphere. Fresh air is just right to release your burden and tiredness of daily activities. Next, the best place to see the sunrise in Yogyakarta is Embung Tambakboyo, Sleman. If you visit Tambakboyo in the afternoon, you will only see an artificial pond or lake surrounded by trees. The place is located in Condongcatur, Depok, Sleman, this is one of the cool spots for local residents to fish. Not many visitors know that Embung Tambakboyo holds its own beauty, especially at dawn. Come here when the sun hasn’t revealed itself, and you will see the hidden beauty of Embung Tambakboyo. The natural atmosphere and the stunning lake make everyone feel at ease and comfortable in this place. The recommended of popular food in Yogyakarta you have to try. Plaosan Temple is not as famous as other temples in Yogyakarta. But, the panorama of this temple at sunrise on the eastern horizon is really tempting. The architecture of the temple forms a unique silhouette gilded in golden light. Plaosan Temple is not far from Prambanan Temple, precisely located at Plaosan Hamlet, Bugisan Village, Prambanan District, Klaten Regency. To reach this temple, you only have to travel about 1 km to the north of Prambanan Temple. If you want to see the sunrise in this place, you can see it from this unique temple. Definitely you will find the sensation of the beauty of the surrounding landscape. Pok Tunggal Beach, the exoticism of the beaches in the Gunung Kidul area cannot be denied by everyone who reached there, as well as the sunrise that approaches every morning. One of the most charming destination is at Pantai Pok Tunggal. The reddish light emanating from the horizon created a beautiful silhouette of the duras tree which became an icon on the beach. The traditional markets in Yogyakarta best for shopping. Embung Nglanggeran, on the eastern peak you can watch the sunrise but not too far from the east and west peak, you can find Embung Nglanggeran which is astonishing as well. Towards the evening, this artificial lake that was once Mount Gandu reflected the dusk of violet light on its surface, mesmerizing anyone who witnessed it. Bukit Bintang, a hangout located in the hills of Pathuk, this Yogyakarta-Wonosari Highway offers views of the city light from a distance at night. Therefore, this place is one of the favorite hangout places for Jogja youth. When the morning sunrise emits a warm and enchanting aura of light that sees it. Well, those are a few recommendation about the best places to see the sunrise in Yogyakarta. Actually, there are still many more top places to watch the sunrise. Maybe you can find it by your own and recommend it to your friends. Happy holiday!